Alpine Chrome Trim Promotional Ballpen - Express Corporate - Promotional Products - Delivered Fast! Alpine Chrome Range. 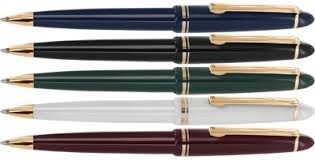 Traditional cap-action promotional pens with a stylish look. Great quality at a great price and suitable for all promotions. Fitted with jumbo refills to keep your messages flowing in the generous print area 40mm x 20mm. Available in 5 solid colours with contrasting chrome trims. Looking for Gold trims? Then look at our Alpine Gold range. Quantity Discounts Save up to 60% when ordering higher quantities of our promotional pens! Call our sales team now on 0845 500 4420 for details! Additional Print Colours Additional print colours are available on this item. Please call our sales team for a personalised quotation. Express Service This item is available on our 24 Hour Express Service! Your pens will be despatched in just 24 hours from your artwork approval! For next day despatch, orders must be received by 10am.